Grave concerns over government plans to build six hydroelectric dams on the Salween River. The dam projects would be used to sell hydropower to Burma’s neighbors, China and Thailand. The planned dams lie in ethnic conflict zones where the critical issue of control over natural resources remains unresolved. 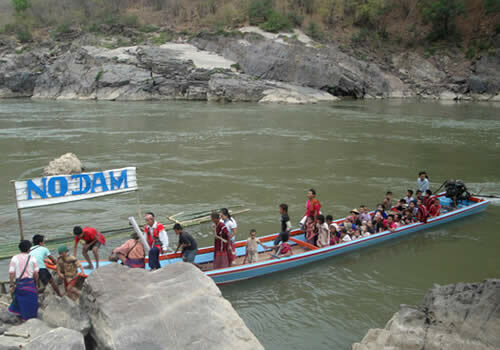 Members of Burma’s Rivers Network (BRN) including the Karen Rivers Watch, Shan Sapawa, Karenni Civil Society Network and the Mon Youth Progressive Organisation, have expressed concern over government plans to build hydro-electirc dams on the Salween River. BRN said that its members were concerned at the lack of transparency around the Salween dams, and the failure of investors to adhere to international dam building standards. No impact assessments have yet been made public, despite the potentially devastating social and environmental impacts of the giant dams on the Salween River. Securing the dam sites has involved increased militarization, attacks and human rights abuses by Burmese government troops, said BRN in a media statement. “Preparation for the Kunlong dam in northern Shan State, involved crushing the Kokang ceasefire army in 2009, driving over 30,000 refugees into China.” BRN said. In March this year, the Burma Army launched an offensive against another ceasefire group, the Shan State Army-North (SSA-N) to force them out of bases along the Salween River near the planned Nong Pha and Man Tong dam sites. Shelling of civilian targets, use of civilians as human shields, and other abuses led to the displacement of about 2,000 villagers in Tangyan, BRN said. Skirmishes between the Burma Army and Shan State Army-South around the Ta Sang (Mai Tong) dam site in southern Shan State continue despite a ceasefire. The latest attack took place in mid-October in Kunhing, which lies in the potential flood zone of the dam and is already largely depopulated by repeated anti-insurgency campaigns.